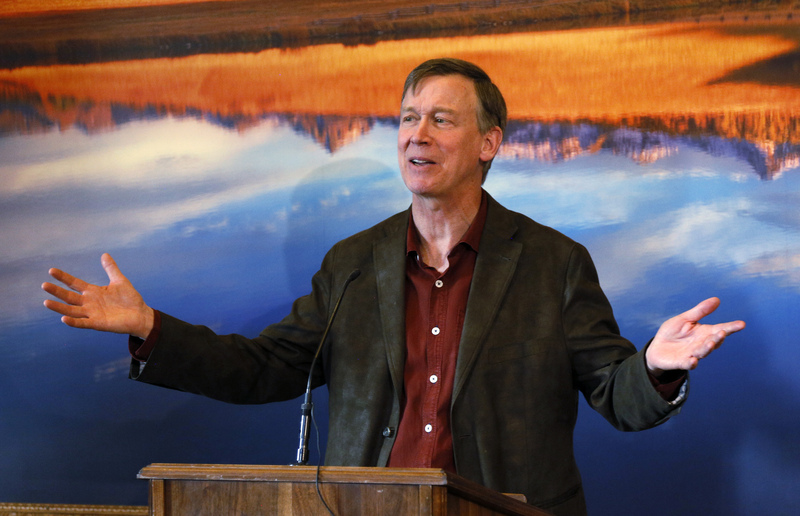 2020 Hopeful John Hickenlooper’s Bringing Together Oil Companies And Greens Was More ‘Coercion’ Than ‘Kumbaya,’ Expert Says | Watts Up With That? A free market think tank leader criticized former Democratic Colorado Gov. John Hickenlooper’s claim he brought energy and environmental interests together to support methane regulations. “He’s not telling the truth when he says that,” said the Independence Institute’s Amy Oliver Cooke. Hickenlooper is running for president in 2020, framing himself as a pragmatic, moderate Democrat. Former Colorado Gov. John Hickenlooper kicked off his 2020 presidential bid as a pragmatic, moderate Democrat by claiming he brought oil and gas producers and environmentalists together to support regulations on methane emissions. However, that’s not how Amy Oliver Cooke, director of the Energy and Environmental Policy Center at the free-market Independence Institute, remembered it. Hickenlooper’s 2020 campaign announcement video highlighted the former governor’s results-driven, pragmatic agenda, including a time he got oil and gas companies and environmentalists to support methane regulations. However, Cooke said that while major Colorado oil and gas producers supported methane regulations, it was not some voluntary “Kumbaya” moment. “It was straight-up coercion. They weren’t trying to help the industry be better environmental stewards, they were trying to give Hickenlooper a political win,” Cooke said. According to Cooke, it all started with an investigation launched in 2012 by the Environmental Protection Agency (EPA) and the Colorado Department of Public Health and Environment (CDPHE) against Noble Energy, Colorado’s second-largest oil and gas producer. EPA began monitoring small leaks from Noble’s operations with infrared cameras — methane is a greenhouse gas that’s invisible to the naked eye. EPA didn’t inform Noble about the results of its investigation until 2014. In the meantime, EPA and CDPHE widened their methane leaks investigation to include other oil and gas companies in the Denver Basin. A source close to the investigation told Cooke in 2017 that EPA and CDPHE put pressure on hydrocarbon producers to settle with the agency. Colorado Governor John Hickenlooper lays out his plans for the next state legislative session at a news conference in his office at the Capitol in Denver December 19, 2013. REUTERS/Rick Wilking. “Facing an EPA with an unlimited budget and a legal process that already favors them, an operator’s compulsion to settle is strong,” the source told Cooke. The source added that “CDPHE has filed parallel enforcement actions” and argued every methane leaks from tanks, including self-reported ones. Ultimately, that “operational standard is unachievable and exceeds even that of the national regulations that were patterned after Colorado’s,” the source said. Pressured by federal and state regulators, Noble Energy agreed to support first-ever state methane regulations. Colorado’s three largest oil and gas producers — Noble Energy, Anadarko Petroleum and Encana — worked with the Environmental Defense Fund (EDF) to craft the rules in 2014. Those regulations went into effect in 2014 with Hickenlooper’s support. The next year, Noble Energy agreed to a consent decree that could end up costing the company $73.5 million to upgrade its equipment and implement new programs to clamp down on methane emissions. However, the oil and gas industry was not in lockstep with major producers. The Colorado Oil & Gas Association and Colorado Petroleum Association opposed methane regulations. 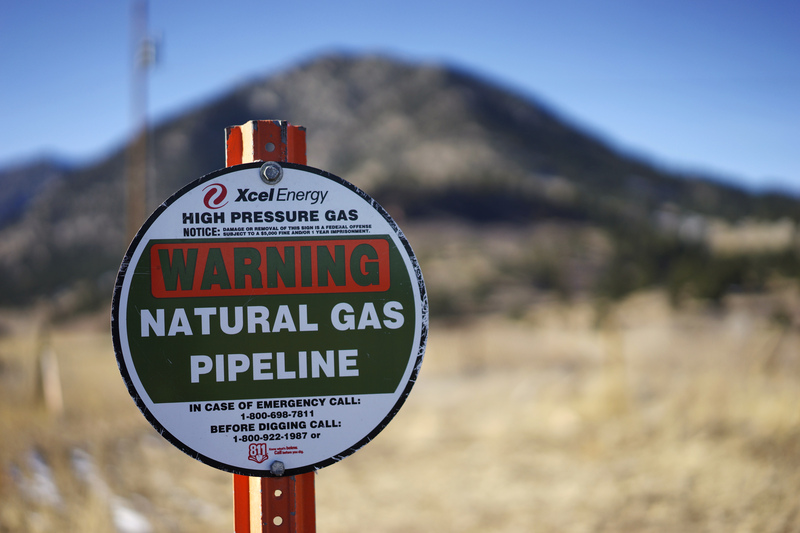 A sign marking the location of a natural gas pipeline is seen in Golden, Colorado February 2, 2015. REUTERS/Rick Wilking. “He worked with a few companies on that deal, not the industry overall,” said Kathleen Sgamma, president of the Western Energy Alliance. EDF did not respond to TheDCNF’s request for comment. Likewise, Hickenlooper’s campaign did not respond to TheDCNF’s request for comment. A quick google shows considerable concern that over regulation is destroying America. It also shows considerable concern that President Trump is destroying America by getting rid of regulations. There’s evidence to support both views. Do regulations stifle innovation? Do regulations promote innovation by encouraging entrepreneurs to find ways to circumvent those regulations? Maybe the problem isn’t the regulations per se. Maybe the problem is the unaccountable bureaucrats who generate and enforce them. This may be a start. Yeah, all that “overregulation” of oil and gas in Colorado really depressed their production allright. It is only quadruple what oil and gas production was in Colorado just 9 years ago. Colorado oil and gas producers are so hampered and constrained that Colorado has managed to push itself to the 5th largest producer of oil and the 6th largest producer of gas in the US since Hickenlooper came in. Oil and gas companies oppose anything that costs them anything. It’s what they do. I don’t blame them for wanting to minimize costs – that’s business – but don’t whine about all that heavy handed government regulation when they are in the midst of their greatest production and greatest growth in history. Making sure that methane releases are minimized seems like the very least the producers can cough up in return for their unmatched economic success. Perhaps without as much regulation they would be even more successful in their production. That would be good for their investors. But not good for people who breath the air. Profit is good. Too much profit at the expense of everything else, including human health and safety, is called “greed”. I used to live and work in the oil patch of West Texas, but at a nuclear facility. In the nuke industry we have always taken human health and safety extremely seriously. Our challenge was that we had to recruit from the local population, and virtually none of the oil field workers had any appreciation or concern for worker health and safety. We had to literally reprogram their brains to get them to think about how to work safely, rather than just quickly and dirtily because that was the mentality in the oil and gas industry. Having worked in California, letting lawyers and fundraisers for green groups write and enforce “pollution” regulations is a formula for chasing zero. As “pollution” is evil, eliminating that evil is automatically a good thing. Cost-effectiveness does not enter into their planning, as it is not their funding they are allocating. Pollution is nearly a religious term for the greens, and actual harm does not really enter into the definition. What exactly is toxic to breathe? They burn off the methane. And even if not burned, methane is not considered toxic. Hey Duane, so what?! Dairy farmers don’t have the same appreciation or concern for worker health or safety that oil field workers have. Bakery workers don’t have the same appreciation or concern for worker health or safety that dairy farmers have. Teachers don’t have the same appreciation or concern for worker health or safety that bakery workers have. To each, their own. I’m sure there are probably appreciations or concerns that dairy farmers have that workers in your industry didn’t. Maybe, being able to repay the loan or being able to balance the checkbook. Different industries have different margins of profit. Walmart has a very different profit margin than Apple has. Retail is currently shedding lots and lots of jobs. What does methane have to do with appreciation and concern for worker health and safety?? icicil – no, the oil producers did NOT burn off the methane, they let it vent to the atmosphere. The new regulations seek to reduce those emissions. Flaring off gases is not a violation of the rules, it is done all the time. Oil and gas producers also quite frequently fail to control an even more deadly emmision – that of hydrogen sulfide. In West Texas it is very common to smell that “rotten egg” smell of hydrogen sulfide, which is at a minimum annoying. The problem is, if you can smell it the concentration is too low to hurt you, but if the concentration is high enough to kill you, you won’t smell it you simply die. From time to time production wells in West Texas will “burp” hydrogen sulfide and sometimes workers are literally killed off in the process if they happen to be there when it burps. It’s just the cost of doing business in the oil patch, apparently. Jim – then stop yur whining for those poor little dears in Colorado who are massively increasing their production and profits yet are still whining all the way to the bank that they have to do what all other industries in the US do – which is to properly control their emissions of air pollutants. The regulations will, and should, continue. The whining needs to stop. So what if they vent it to the atmosphere. It’s not like it presents a problem. When oil and gas companies complete a well there is a certain amount of “cleanup” of the gas that has to take place before it can be turned over to the transmission company. Wells are sometimes fraced with either nitrogen or CO2 to speed up cleaning up the frac water and minimize weeks of potential swabbing (and even more flaring). Gas producers would be more than happy to sell this contaminated gas to the pipeliners but to maintain the integrity of the pipelines, the gas has to be clean. The flared gas is tested for O2, CO2 and N2 and is flared off until it meets the high standards of the pipeline company. There is no other choice. The COGCC understands this but few others do. Apparently some on this posting are not aware of this either. When a gas well is in normal production mode there is gas that comes off the tank that holds the condensate produced in conjunction with the gas. This associated gas is evolves from the condensate in proportion to the amount of condensate produced and the ambient temperature surrounding the tank. There are also dumps that operate on the separators that produce a small volume of gas. These dumps have been redesigned to operate with as little venting as possible. If it were economically possible for gas producers to capture and compress this gas into the sales line, the gas companies would do it. It is not. You do see vapor recovery systems at major tank batteries. Gas wells are small individual tank/separator systems. There are no liquid lines sending the condensate to major batteries for vapor recovery because in most cases there is very little condensate being produced. Most of the wells producing in Colorado are “dry” gas wells. Not much condensate. Duane, you should tell where you’ve learned that methane in the open is likely dangerous as coal dust in a coal mine or flavor in an airtight bakery. – Can you explain why tort law couldn’t accomplish the exact same thing? Or in a court of law would plaintiffs be unable to prove any actual HARM from methane? The working class, generally, is under attack by the SJW cultural Marxist left, but conventional energy workers in particular. Methane is a fascinating vehicle to cripple an industry. If you attack the oil and gas industry for emitting it, then you have to attack the dairy and cattle industry for emitting it. I ask again, can you explain why tort law couldn’t accomplish the exact same thing? Seriously, you think that lawyers sueing companies is an efficient means of preventing the harm? I don’t even need to attempt to explain that. Every other industry in America is regulated as to air emissions as well as surface water and ground water discharges. Why should oil and gas be treated any differently? In point of fact, the oil and gas industry has been the least regulated industry in America. Apparently you are not aware of the vast regulations that affect the oil and gas industry. Pick up the CFR for oil and gas and try to muddle through that for awhile. What surface and ground water discharges are you talking about? Produced water is either taken to an approved evaporation pond or pumped into approved disposal wells. Frac water is captured in flowback tanks and reused or disposed of like produced water. Interesting. The fact that regulations haven’t killed the industry is proof that regulations don’t harm industry. But look at the costs you, the consumer, have to pay for activist/bureaucrat fun and games. The Niobrara field has consistently been the slowest-growing of the new “tight” oil fields, much slower than Bakken, Eagle Ford or the Permian Basin. Production is mostly tied to the price of gas but there is a lag in production vs price as demonstrated by the rig count. Right now there at 35 rigs running. At it’s height there were something like 80. So the production rate in Colorado will start down. The effect of overregulation can be seen in the number of larger oil and gas companies leaving the state and selling off their assets to smaller companies that can operate with greater flexibility. Encana, Williams, Marathon are just a few that have left. Keep your eye on Hickenlooper. He has ties to the Council on Foreign Relations, and his family has ties to Bilderberg. He’s an inner circle technocrat with ambitions of power and control. And he’s a pervert. I have it in good authority from a co-worker who used to party with him. She was disturbed about it and stopped hanging out at his loft above Wynkoop brewery. He’s a white dude. He doesn’t stand a chance in the current democrat party. And if he looks like he has a shot, it’s not like anyone can accuse him of anything. Oh wait, what’s this…. Never seen any tv documentary showing signs in the plain without rust encrusted bullet holes. And there was the Denver Post’s public propaganda fake news lynching of Anadarko over the house explosion in Firestone. I’m looking forward to the NTSB investigation report that ‘splains how methane, which is lighter than air, migrated 50 to 100 feet through porous soil, even though it’s lighter than air, and settled in the basement, even though it’s lighter than air, collected to explosive levels, even though it’s lighter than air, and then, even though it’s lighter than air, detonated when one of the erstwhile plumbers messing with a balky water heater lit the pilot light or cigarette. What’s the possibility that while messing with that heater these two inadvertently leaked gas into the house? Consider all the similar explosions over the decades. In how many was the immediate human element causative? Those two plumbers had an “oops” moment. Or perhaps the water heater was balky because it wasn’t getting enough gas (due to a gas leak somewhere in the line)? Well, it wasn’t Anadarko’s distant abandoned vent line which managed to single out just one house. The house explosion in Firestone was about six miles from my house, I’ve paid a lot of attention to the story and fall out. The root cause was found to be an abandoned line which was not only severed at one point, it was still connected to the main supply. While the line was not laid by Anadarko , the line was laid by a company which Anadarko bought. The homeowner and brother/brother in law who were killed in the explosion did not cause the leak in the first place. Rather, the severed line was leaking into the basement. I believe that the gas was unodorized also and thus not detectable by smell. They didn’t know the existence of the hazard. Ugh. That is so upsetting. How does methane, which is lighter then air, suspend the laws of physics, flow horizontally and settle in the basement? Did it “flow horizontally” or did the line from the well happen to also run under the house (which was constructed after the lines were laid down”)? I would think it “settles” from the top down. Settling at the top of the room and working it’s way down as more and more of it leaks into and fills the room. Do you have any evidence of that or just blowin’ out your…. They dug the basement and didn’t notice a line? Now you’re just pullin’ stuff out of your…. Yes you clearly are. Learn some physics before spouting your conspiracy theories. The physics of lighter than air materials is that they rise to the top of whatever container they are in (In this case a room, which means they’d rise to the ceiling). Just as heavier than air materials sink to the bottom of whatever container they are in (in this case a room, which means they’d sink to the floor). And just like any substance the more of it that you put in the more it gathers (ceiling or floor) filling up that space and working it way though the space it doesn’t fill (down from ceiling or up from floor). physics 101. Also remember it doesn’t have to have occupied the entire space. If there’s a leak at the bottom of the room and, being lighter than air, it’s gathering at the top of the room then that means somewhere in that room there’s a path of the substance, a stream of odorless colorless gas, going from the leak source at the bottom to the gathering place at the top. All it takes is for somewhere along that path to ignite, the burning gas will follow along that path until it reaches the larger mass of gas that had gathered with the expected results when it does. Only bother replying if you have something intelligent to say, or some pertinent facts to add. If all you have is more ad homin nonsense, then don’t bother. Packaging and spin are everything in the political game. He certainly has paid his Party dues….by drinking the river water of the Animas River in defense of EPA administrative stupidity under Obama. I don’t think Hickenlooper is a viable contender. He will bring the climate change issue into the public view, as will other Democrats. We’re going to get our CAGW debate between now and 2020 election time. The Democrats are going to keep the issue front and center. That is probably why Trump gave Happer his new assignment. Hickenlooper is known as Howdy Doody by his Colorado detractors. Frankly I can’t stand the man, and as a President he will staff his administration with the same sorts of people Obama did, and then front with happy talk as they harass the economy. Indeed. Just the fact that he’s an old white dude is enough to bring his chances down to 0.0 in todays intersectional democrat party. He was also know as Governor Chicken Pooper. If he thinks he is running as a moderate Democrat in a party dominated by Marxist he is toast. “I’m running for president because we need dreamers in Washington.” He’s dreaming if he thinks the Marxists will let him anywhere near the nomination. People like Hickenlooper and Biden may have a chance in the Dim primaries because the leftist loons could split the crazy vote between themselves. His house in Denver was built in 1905 4,600 square feet and only he and his wife live there full-time. Gas furnace, A/C, gas bar-b-que and a swimming pool. No rooftop solar panels and a wall separates his property from the alley! If you’re gonna talk the talk at least walk the walk. The freak show in the White House is pushing the electorate towards a Democrat in 2020. Trump backlash may well put a (another) nut job in there. Hickenlooper has a degree in geology, drank starch based frack fluid, and is the candidate you all ought to be praying for. Doug, the antics of the loony-left freak show in congress will push the electorate towards re-electing Trump in 2020. Hickenlooper has a degree in geology, drank starch based frack fluid, and is the candidate you all ought to be praying for. As a moderate and as an old white dude, he doesn’t have a prayer of a chance in todays loony-left democratic party. Neither does Joe Biden. Only someone who is far-left and high up on intersectional points is going to get the nomination, which is only going to push the electorate even closer to re-electing Trump, like it or not. As a longtime Colorado resident, I can say that Hickenlooper is no moderate. In fact, you can’t use the word moderate and Democrat in the same sentence (unless a negation is also being used). The sad thing is the rest of the party has gone so far to the left that even a not-really-a-moderate like Hickenlooper ends up looking somewhat moderate by comparison. Stand him next to AOC, Sanders, Harris, Warren, or Booker, or any of dozens of others any of us could name and he ends up looks like the moderate adult in the room. I seriously doubt that America would elect a guy named John Hickenlooper to be President, just because of the giggle factor of his name. If he is going to have a shot, he should seriously consider changing it. Hmmm… Ed. Yeah, that’s it. Ed Hickenlooper. Sue and settle. A tried and true EPA tactic in Colorado fully endorsed and spun by Hick to his advantage. Collusion by any other name. Then along came Pruitt. Thank goodness for Pruitt!